Pruning your Camellia trees and shrubs takes time. Most importantly, you need to have a goal in mind for your plant. Overall shape? Plant size? Plant health? Keep reading to find out how to start thinking about how to prune your Camellia plants and learn three different goals you can try in your own garden! Prune Your Camellia with Your Goal in Mind. In this DIY Garden Minute Ep. 49 - "Camellia Pruning and Other Beneficial Care Tips," we'll teach you how to start thinking about your pruning goals for each plant with three different goals or scenarios AND then briefly go into how to do it along with types of cuts to make. This episode is meant for any level of gardener who wants to learn more about the Camellia plant and helpful tips on how to care for and shape their plants. Do you like more natural-looking or finely-shaped plants in your garden? Is your attention drawn more to specific shapes in a landscape or a connecting flow between plants? What we are describing here is the difference between a plant's natural form (informal) of growth or a more manicured look (formal). Think of the formal look when you see an English Garden or an "estate" garden where plants and beds are perfectly shaped in smooth forms. There are even Topiary Camellia plants. When you see a garden with informal growth and shaping, this is considered a more natural look and how the plant would look in its native habitat. Keep reading to learn more in this episodes show notes. Also, to learn more about pruning your Camellia plants with a slightly different approach, read this webpage from the American Camellia Society. Any pruning should follow Our 3 Pillars of Pruning, first. Listen to DIY Episode 10 to hear more! Goal #1: You want to either start or keep training your Camellia into an Informal (natural) growing tree. Goal #2: You want to either start or keep training your Camellia into an Informal (natural) growing shrub. Goal #3: You want to either start or keep training your Camellia into a Formal (unnatural or shaped) tree or shrub. 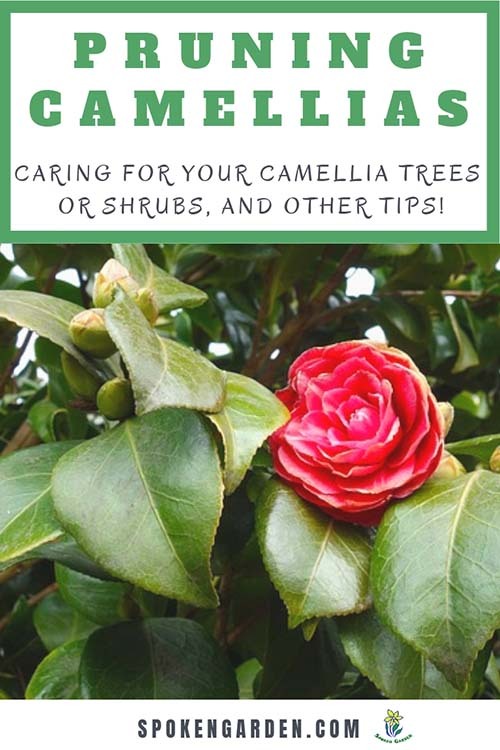 Click the graphic above to save "Camellia Pruning" to Pinterest for later! Camellia Pruning and Other Beneficial Care Tips! Learn about pruning your Camellia plant in a nutshell with these 3-goals in mind! 3 different ways to prune your Camellia shrub or tree based on your pruning goals. How to apply thinning and heading cuts to shape your Camellia shrub or tree. What the difference between formal (shaped) versus informal (natural) pruning.